Five easy yet significant swaps to help you reinvent your space. Renovating a bathroom can be a costly endeavor, hence why most tend to fare away from what typically becomes a grand undertaking. When taking into consideration the prominent design elements involved—i.e. revamping the shower, vanity, or something as seemingly simple as installing new tiles—it’s easy to get overwhelmed with the array of possibilities, which, more often than not, are limited due to budget constraints. And while a complete overhaul of the space would definitely be ideal, it’s neither the most practical or cost-efficient course of action. Enter the simple yet significant swaps you can make that will transform even the most tired of spaces. 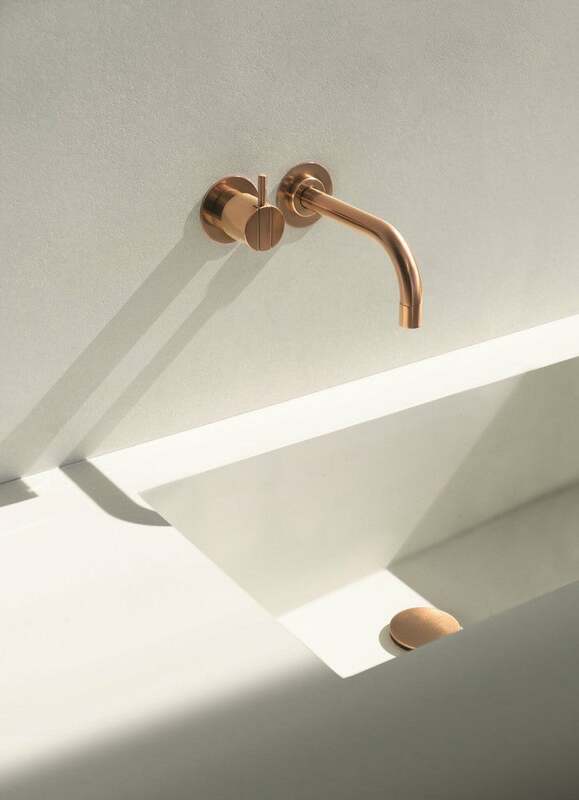 Bathroom fixtures—we’re talking about the faucet and showerhead here—are a great example of commonly overlooked components of a space. Settling on a budget-friendly option may seem like a cost-efficient strategy but in the end, it’s highly likely that you will be compromising on style. Obviously, when compared to the alternative of having to replace the flooring or springing for a new vanity, the thought of splurging on fresh fixtures doesn’t seem too bad. Should you have any doubts, allow this stunning moment, courtesy of Vola, to settle your reservations. Sleek, streamlined, and lustrous to a captivating degree, making this easy swap will instantly transform your entire vanity situation. When was the last time you took to your bathroom with a fresh coat of paint? Unless you’re coming fresh off of a reno, it’s safe to say that that off-white shade of eggshell the room originally came with is the one that can still be found on the walls. We’re here to change that. Well, more to encourage you to change that. Even if you’re not completely overhauling the bathroom, or not feeling up to the task of painting the entire room, designate one wall as the focal point and take to it with an unapologetically loud and vibrant hue—intricately patterned wallpaper prints are also acceptable. Take a cue from this color-filled spot, which would’ve never had the same effect sans the eye-catching print, beautifully complemented by the cool teal hue of the cabinetry. Photography by Little Green Notebook’s Jenny Komenda created a beautiful bathroom for her home’s redesign. The green walls combined with the dark black tub create contrast and a calming oasis. Lighting is hardly ever a decorative element one puts much thought into when it comes to the bathroom. More often than not, we settle on the existing fixtures—especially when we’re working within the confines of a rental—but it doesn’t have to be that way. Invest in a lighting solution that will lend a style-focused detail, all the while providing the room with a beautifully functional feature. If you’re feeling bold, bring in a chandelier (just like Jenny Komenda did in her Nashville home) for an elegant upgrade. Alternatively, you may opt for a plug-in sconce—a non-committal install you can easily pack up and take with you when you move. Mirror, mirror on the wall, who’s the fairest of them all? This bathroom and its mirror are definitely it. Every bath comes with a mirror and so why not make it a design-forward one? Swap out the existing one in favor of an alternative that makes a style-focused statement. If your space comes with a built-in medicine cabinet, don’t fret—you can install a smaller yet playful one (this whimsical option is a standout favorite) on an adjacent wall. Mirrors are a master of depth-defining illusion, especially when it comes to small spaces, and that’s something we’re always in favor of. Swapping out the handles or knobs of a cabinet falls under a renter’s 101 guide to making the most of their space. And for good reason. New pulls have the stylistic power to instantly elevate even the most dated cabinets or bathroom vanities. We love the brand Superfront for their vast array of Scandinavian-inspired additions, each unique and beautifully designed in their own right. Moreover, their curated collection is one geared towards Ikea’s budget-friendly storage essentials, which means a customizable bathroom is more attainable than one may think. Outfit an existing vanity or chest with a new front or legs and you’ll be surprised at the dynamic effect the new facelift will have on your space.